Transform your kitchen in one day with countertop refinishing without demolition or removal. We are the Tri-Cities, TN kitchen counter top refinishing experts. Call (423) 612-4174 to start making your kitchen remodeling ideas a reality with professional Tri-Cities, TN countertop laminate resurfacing services from Miraculous Makeovers. Get instant savings with our online specials page. The kitchen counter top in your home greatly affects the value of your house, and refinishing will make the home more enjoyable to live in and more impressive for guests who visit. If you want to update countertops without replacing them in your home’s kitchen, working with one of our professional kitchen counter top refinishing experts ensures that the resurfacing process goes smoothly. We serve residents throughout Tri-Cities, TN and the surrounding areas. To see what other customers in Tri-Cities, TN and surounding areas have to say about our kitchen counter top refinishing services, simply visit our countertop refinishing reviews page. When Should You Refinish Countertops? Countertops will eventually wear down due to extended use, causing breaks and cracks on the surface. While this may not seem like a huge issue, broken Laminate exposing the wood can cause rotting underneath your counter, additionally it can cause damage to your cabinets as well, so it’s important to call for refinishing services as soon as you notice any surface damage. While most homeowners reface laminate countertops to achieve a more updated look others choose to resurface laminate countertops to save money and further issues. What Kind of Paint to Use on Countertops? So you’ve decided that you have enough problems with your kitchen countertops and need to resurface them. What kind of paint to use? We recommend professional coatings to our customers. Kitchen countertop refinishing has become more popular on the market and it is more cost effective than purchasing granite countertops. 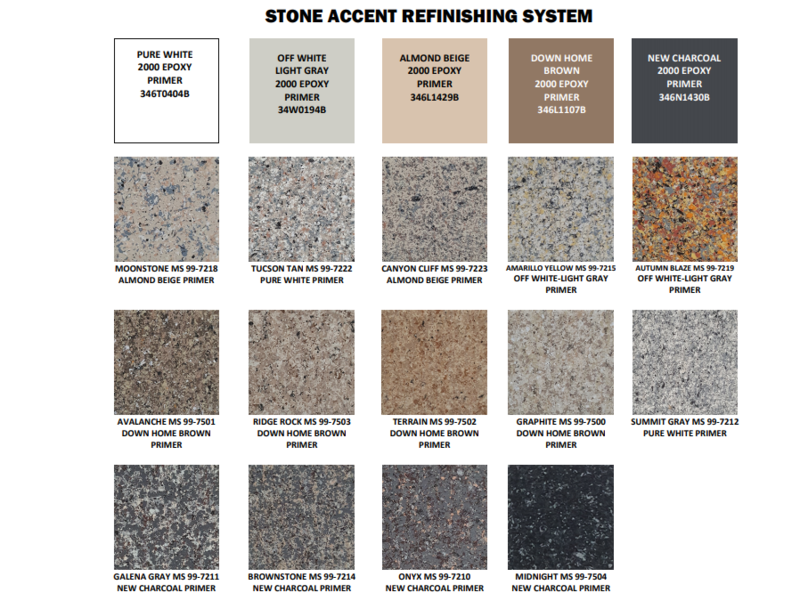 With our stone look finishes, you will never need to reseal or deal with the issues that come with tearing your old countertops out. 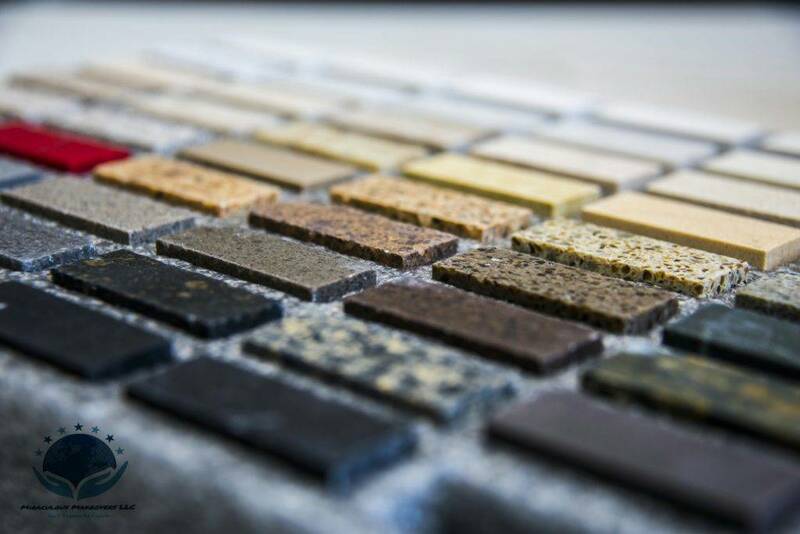 Regardless of whether you choose a solid finish, a custom stone look, or considering painting countertops to look like marble, we are trained and certified to do it all. The benefits of kitchen counter top refinishing, is the way that they are anything but difficult to keep clean. Damaged areas on your surface can be spot repaired when required, in addition to, you get the stone look without the rock cost. This type of service will definitely save thousands over replacement. If you have damaged countertops in your home or business and are searching for countertop refinishing companies, our high quality primers and topcoats will breath life into your surfaces and have them back in use in just one day. Countertop refinishing prices vary upon length and width of your countertop, additionally take into consideration that the cost of countertop resurfacing depends heavily on if you are looking to get a solid finish or countertops that look like granite but are cheaper. Should I Go With a Lowes Rustoleum Countertop Transformation? If you’re looking to sell your home in the near future, a do it yourself countertop refinishing kit will not give you the quality your looking for. Kitchen counter top refinishing when done by experts can easily turn on potential buyers and will increase the value of your home. Updating your existing countertops is better economically and can give you an excellent return on your investment. If the kitchen is a place you entertain guest, why not make it comfortable and more appealing? When we are finished refinishing your kitchen countertop, you’ll want to show it off as much as possible! Customized solutions for you: There is never a one size fits all solution when you work with us. We hear all your concerns so we can recommend you the most cost-effective solutions possible to meet your target budget and your specific needs. Trusted local experts: As a locally owned business we know that it’s important to work with experts you can trust to help your family and friends. We understand the refinishing needs of Tri-Cities, TN residents and ensure expert results on every job. If you’re planning a kitchen counter top refinishing update, give us a call at (423) 612-4174. Miraculous Makeovers is your Tri-Cities, TN source for fast, expert countertop stone look finishes.